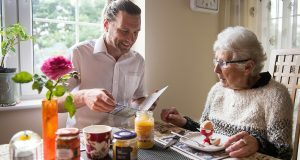 Outreach is a registered care service that puts those we care for at the centre of all we do. You can tell us what you need, when and where, and we’ll make it happen. We can take you to appointments, social engagements, anywhere you need or want to go. We’re available from 8am to 8pm, Or later if you need us. 7 days a week. Anyone who would like help to get out and about, would love a bit of company, or has dementia and are still living at home, aged 50 plus. So you can soon be outdoor-bound rather than house-bound. Getting out and doing things you still love at your own pace with the support of a qualified member of staff, that’s what LifeCare’s extra years of zest is all about. We take time to match you with the best member of our care team. That attentiveness is what matched lemon-curd loving Matthew with lemon-curd loving,ninety years young May. What’s more, since we offer longer visits and quality care, we attract the most compassionate and caring people to our team. I am delighted with the wonderful care that we receive. Nothing is too much trouble, even when we change arrangements sometimes at short notice. As a registered care service, our team will, of course, provide the best possible care. But we also match the right person to your interests as well as your care needs, to ensure you get the best companionship too. Sharing news over a coffee, or taking a trip to the beach or the gallery are just some of the activities we can do with you through our Good Company service. In fact, if you name it, we’ll arrange it. If you can’t make it to see a loved one, we can do this for you. Our hospital and care home visiting service means one of our team can visit and brighten their day. Since our staff are qualified, we can also accompany on walks, or other activities to enjoy a change of scene. Having the continuity of someone who knows exactly what you like as well as the reassurance of a familiar face – makes all the difference. Rise and shine with our personal care and wake up service. We’ll help you get up, washed and dressed and ensure you have the right medication. We can stay for breakfast and a chin wag if you like. Whatever you need, we’re happy to help. We can get you ready for bed and help with personal care and make sure you take the medication you need. But this evening service is as friendly as it is functional. We’ll have a chat and see you settled before we go. As a carer, it’s important you get a well-deserved break. We understand that you’re often so busy looking after a loved one you don’t get to look after yourself. The service starts from just two hours or can be longer, as required. We can look after your loved one at home, or take them out for a break too. The good news is no referral is necessary. Arrangements can be made and the service can begin straight away. Outreach can be arranged on a private basis or by using your direct payment from the City of Edinburgh Council.